As I started to write my first column as President of the Gulf Coast Section of the SEPM, I began to think how I became involved with the Section and more importantly, with the Executive Council. Having attended a few recent GCSSEPM research conferences myself and referencing a number of technical papers from previous conferences, namely 1993, 1994 and 2004, I always knew of the Section and its associated research conference. In addition, the number of highly skilled technical individuals associated with the organization most certainly drew my attention. In terms of my involvement with the Executive Council, two very distinct things come to mind: sitting around a campfire in South Australia with colleagues participating in Flinders Ranges salt tectonics research (among the group was Past President Carl Fiduk) and the ever-apparent age gap in our industry. This age gap will be a theme throughout my note to you, but more on that in a few paragraphs. After a lengthy discussion about ways to involve the younger generation in local Houston-based geological societies, Carl posed the question to me of whether I would like to run for the position of Vice President for the GCSSEPM. Not knowing what I would get myself into, I most certainly agreed to the task because I thought this would be a good way to get involved and offer insight from the perspective of a younger generation. Roughly a year later, having ventured further into uncharted territory, I find myself President of the Section by default (see Carl's Fall 2014 President's Column for more details). I am honored to have such a position, to walk in the footsteps of so many esteemed Past Presidents and to have the encouragement of my fellow Executive Council members and the Board of Trustees to take on the task. I know I have big shoes to fill following Carl's departure and hope to continue all of the efforts that he, the Executive Council and the Board of Trustees have tirelessly worked toward during 2014. 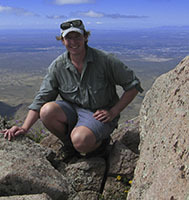 A little bit about myself: I graduated in late 2013 from the Colorado School of Mines with a PhD in geology, having completed outcrop- and subsurface-based salt tectonics research in the Flinders Ranges of South Australia and the northern Gulf of Mexico. My research was focused on the evolution of steep diapirs to shallow salt sheets, including the integration of detailed geologic mapping of multiple outcropping salt diapirs and flanking growth strata, seismic interpretation and structural restorations. I apply many of these interests in my day-to-day technical work at ConocoPhillips, where I am a member of the Structure and Geomechanics team. I have been tasked with research and development in salt tectonics and with applied technical services to our business units operating in salt-dominated basins worldwide. In addition to this, I volunteer some of my free time to the GCSSEPM. We have a lot going on here at the GCSSEPM for 2015. From the Executive Council side, I would like to welcome Sophie Warny as our new Vice President. Sophie is an associate professor of palynology at Lousiana State University, one of our core Gulf Coast universities. I would also like to welcome President Elect Dorene West, who is currently a staff geologist at Nexen Petrolum. Charlotte Jolley, who has served as Secretary for the last several years, will retire her duties at the end of 2015. Brandi Sellepack graciously offered to extend her duty as Treasurer until the end of 2016. After three years of dedicated service, we are sad to see Mike Blum depart from the Executive Council. A big thank you goes to Carl Fiduk, who served the Section for the past two years and continues to serve as Past President. I cannot thank you all enough for your hard work and dedication to the Section. Finally, I would like to thank the Section Trustees, who help guide the overall direction of the Section and offer advice to the Executive Council. All of your efforts keep us operating and we appreciate everyone's involvement! As many of you know, almost 24 months will have lapsed before the 2015 Perkins-Rosen Research Conference, which is focused on "Petroleum Systems in 'Rift' Basins." The conference is slated for 13-16 December 2015 at the Omni Westside in Houston, TX. Technical Co-conveners James Coleman, Paul Post and David Brown have arranged an outstanding technical program that I am sure you will not want to miss. And, you read it correctly...the Executive Council voted during Autumn 2014 to rename the Bob F. Perkins Research Conference to the Perkins-Rosen Research Conference to honor our Executive Director Norm Rosen. Norm's tireless efforts over the years have helped mold what GCSSEPM is today. We will host an 'official' announcement during the conference, but we wanted to make everyone aware of this special news as soon as possible. We appreciate everything you have done for us and continue to do for us, Norm! In similar fashion to the 2014 research conference, for the 2015 conference, we will continue our focus on students by offering a student poster session and we hope to offer another student short course, both of which were very well received in the past. The short course, entitled "Structural and Stratigraphic Framework, Northern Gulf of Mexico," will be taught by Carl Fiduk (Past President), Bruce Hart (Past President and current Trustee), Ursula Hammes (Past President) and Mike Blum (Past President) focus on the Gulf of Mexico. Speaking of conferences, the GCAGS/GCSSEPM annual conference will be held in Houston, TX 19-22 September 2015. Several GCSSEPM officers and trustees have been involved in the technical organization and planning of the conference. We look forward to attending! Lastly, we have a new initiative between the Houston Geological Society and the GCSSEPM. In an attempt to bridge the age gap shared by both societies, we have teamed up with the HGS to offer a well-recognized, leading scientist from the younger generation the opportunity to deliver a join HGS-GCSSEPM General Dinner Presentation. First up, Jacob Covault, who is a member of the Clastic Stratigraphy R&D Team at Chevron Energy Technology Company, will deliver a talk entitled "Predictive Organization of Deep-Water Lobes" on March 23. We look forward to hearing Jake's talk and hosting additional speakers during the latter part of 2015. With that, I will sign off and say to everyone that we appreciate your membership and interest in the GCSSEPM. Active participation benefits the Section and its members! Please get involved where you can!